How do you know what career is right for you? I know what you want! It is a career that pays the most, where you have fun and don’t work too hard. Are there careers like that? If you ask people who like what they do, their answer will be yes! What are those careers? Some (well, most) professions require some form of higher education. However, with the modern world we live in, one can go as far as to obtain an MBA, or even a PhD, never leaving home. Sales people generally love their job. Why? They love the fact that they are paid based on performance. They like the freedom of producing results rather than just putting in time. Many sales people do not work in an office which is just fine with them. They like the freedom of the career. Would that career be right for everyone? No! Many people would hate the pressure or stress of meeting sales targets, the constant rejection, and find the self determination to succeed. 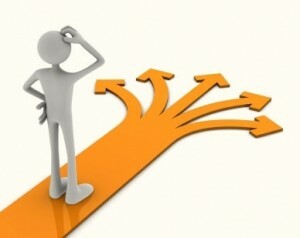 What is important in determining the right career for you? Let’s start with what interests you. As children, we try a lot of things. We try sports, games, reading, and many times we show interest in certain classes in school. Many overlook all these interests when it comes time to figure out what interest them enough to make a career. Children, no matter how old they are, express careers that they are exposed to in their childhood. They say they want to become a Medical Doctor, Police Officer, Firefighter, or a teacher. Did they really research this career and understand what is involved to perform this career? No, of course not! They are just giving an answer to a question. Is being interested in a particular career enough? No! You need skills. If you want to become a Medical Doctor, you need to be good in science. In order to get into a good medical school, you need to be really good in the sciences. To clarify, do you want a doctor who only was a C student in science? I know I don’t! You need skills and talent to be good in a particular career. If you are good at what you do, you will be successful and will make a good living. I chronicle my experience in my journey to success. Let’s think about this so far, you must be interested in the career, have the talent and skills to be successful. Is that it? Not exactly, you need a good work ethic. You know those values like integrity, honesty, teamwork, going to work every day and on time. Is that it? No, you must perform you career to the best of your ability. Last, you need to get along with your boss and colleagues. In other words, your personality needs to fit with the group, department or company. You should be positive and upbeat and adaptable in many different situations. Are you prepared for a career or did you just take a job? If you do not like your career, you probably did not choose it! It is not too late to change, but do it right. Spend the time to find out enough about the career you have interest, skills, talent, personality, and values to be successful. The riches follow! What are you doing? Choose the right career! I’m in tech services, and it’s okay… I enjoy it, but my true passion is investing and finances. Thanks for your comment. Have you thought about tech services in a brokerage or some other financial institution? Gotta respectfully disagree with you here MR. My brother became a financial advisor when he was 41 and another friend of mine did it when she was 43. Have you looked into getting licensed and such? From my perspective, people can do whatever really want to do! I know first hand, I am in my 7th career. It appears MR is not willing to do what is necessary to make his dream come true. Mr is created an alternative to his career. Wow 7th career changes, the stress would overwhelm me easily… especially with 2 kids that I have to provide for. Ironically, I find that I like working with websites and blogging, even more than the finance area. Perhaps that will be my thing after a few more years and I have a solid safety net. All the career changes were related except one. I have to admit, I haven’t looked into getting licensed. series 7 right? Funny thing is your interests and passion(s) can change over time. Changes in your chosen field can also cause you to lose interest in the career you chose originally. I am speaking from my own experience and that of a few of my friends. Changes in how the government regulates an industry can cause people who own businesses in that industry to decide to close or sell them. There are also times where you discover a talent or passion that you didn’t know you had later in life. This is something that’s prompted quite a few career changes. My point is that careers aren’t set in stone even when you put out the effort to find the right career for yourself. Something to keep in mind. When my children went through college orientation, the Chancellor said that they were preparing them for multiple careers. This is true even if you do not attend college for some of the reasons you mentioned. I am a computer programmer/project mgr. I totally would never have pursued this career intentionally. I fell into it, and then it allowed me the flexibility to work from home, and then part time from home. If I were the ‘breadwinner’ of the family, I would be doing something totally different. My MBA is in Materials and Logistics Management, and I love plant floor/quality control stuff. Oh well, it is what it is! I don’t regret my decision for a minute. I get paid decent money, I have a very flexible job, it is just not the perfect match for my personality. Since I accepted my job as being a paycheck and not something to fulfill my emotional needs or whatever, I have been a much happier person. Sounds kind of sad, I know, but I am really quite happy. I will have the freedom to pursue whatever I want when the kids are gone. You don’t have to convince me! You have accepted the situation and it works for you. I think I would try to find something about it to make it satisfying though. I think a lot of people fall into different kinds of work without it necessarily being the kind of work they prepared for. Sometimes that happens out of serendipity, other times out of necessity. It’s not necessarily bad either, because you could discover that you love what you’re doing but never would have chosen it intentionally. People change and evolve over time. I never thought of teaching as a career when I was young. I have been a teacher for the last 10 years and I love it. My former careers gave the financial flexibility to do this. I know a lot of people who have changed their careers (like, completely changed) and they seem satisfied. I think that it’s never too late and a continual lifelong desire for learning is a great asset to have. I am no where near involved in the business field, but as with Money Reasons, my true passion is with investing/ budgeting/personal finance. I like to keep it that way, I don’t think I would like to do it 24-7 (and for other people), I think having it as a “hobby” makes it more fun. It is definitely your choice. When you like what you do, things develop and opportunities occur, it is up to you to take it or ignore it. Hi-Really interesting article and I enjoyed reading all of the comments. I have been so fortunate to have had several careers (university administrator, entrepreneur, realtor, portfolio manager), each appropriate for the time. The most challenging; being a parent ! I resonated to your statement that you can change careers at any age… agreed! I am in my 7th career, working on my 8th as a blogger. Our interests, needs, skills change over time and opportunities present themselves. I have a job not a career and I know it. My J.O.B. keeps me Just Over Broke. That sounds sad! I hope you find fulfillment somewhere else. If it bothered you, you would do something about it. When does working at a job BECOME a career? 3 years? 5 years? Time has nothing to do with it. Two people can have jobs at McDonald’s, one views it as a means to earn money for a car, the other sees it as an opportunity to be a manager or franchisee. It is all in one’s objective. As parents I think we should give our kids a chance to try different things. You’ll never know a talent till you give it a try! I knew very early in life what I wanted and ended up doing that! No regrets! I agree, parents should lead the way to help their children experience all their interests. I am suggesting investigating some additional choices. I think it is important to be open to opportunities. I know that most people in my generation (later twenties/early thirties) and younger know that we will have many employers during our careers. I think we also recognize that we will have to be lifelong learners. Technology just keeps speeding up faster and faster….it is very easy to get left behind the curve. Thanks for your comment. I totally agree! Successful people take advantage of opportunities and learn the necessary skills. I’m in software development. I like it and enjoy it, but I would prefer a bit more flexibility and I don’t necessarily enjoy the office 9-5. I think I’m fairly close to where I would want to be so I don’t mind it too much. I am in my seventh career! Think about what you like and develop a plan to achieve it. Even at my age (64), I am still evolving and developed new goals. I never thought I would be doing this 6 months ago. I went to a training on career development and the main point of the class was it’s up to you to find where these 3 intersects – Talent, Passion, Company (forgot the exact word). Company is basically what is good for the your employer. I liked my career when I first started out, but after 15 years, I’m tired of it. It’s time for me to explore new opportunities. I understand, I am in my seventh career and working on my eighth! The fundamentals are simple, look at what you like and your special talents and try to match it to a career you will enjoy. It is simple but difficult for most of us. I’m definitely in a career that I enjoy. I could see myself doing many things (and I sometimes do), but I’m certainly happy with most of my career decisions thus far! Congratulations! Most people will be in multiple careers and should acquire the skills to handle these opportunities. When I started teaching 10 years ago, I had one set of goals. I am not sure if things changed or I am changing! Teaching gives me enough latitude and time to evolve and I have changed some of my goals. I think successful people take advantage of opportunities and that may change one’s direction in life. Good luck. Thanks for this post. It is always good for one to stay positive and add value to others around them as well. Self improvement, skill development, and talent harnessing are vital ingredients to climb the career ladder. Interest is certainly a huge factor. It’s just a shame that the careers that interest you don’t necessarily pay well. I’m fairly lucky in this respect. When I was about 7 years old. I was given an old computer and I was quite a nerdy child. I loved writing software long before I even understood that it was a profession. Twenty years later, I’m now a professional software engineer and I still love it. I’m very thankful that I still love it and that what I happen to love is fairly well paid! Very few people find their interests so early! Matching your interests with the skills may be even harder. You may be one of the few who were naturals. I remember having to choose a career in high school. We had to do a project about what we wanted to do after school and it seemed like most kids at the time had no idea what they wanted to do. Most picked jobs just because they wanted to get the school project out of the way. I think it takes time to really know what you want to do.. what do you enjoy doing? Then you find jobs or careers that follow that path. Lucky for me I am a self employed father of 3 and love what I do. Money does follow but some times there are hard months where the money flow is much less than the months before. That being said, I cannot quit because I love what I do and know that if I keep going, the money will follow. So true! You can never go wrong following your passion. If wold be really nice that the money starts flowing immediately, but it doesn’t. When you follow your passion, you love what you are doing and eventually you achieve success and the money does follow. I started teaching (10 years ago) which is hardly a lucrative career. I love what I do and thankfully money is not an issue, but new doors are opening up. I started blogging a year ago and it is starting to pay off. I just wish I started following my passions back in high school instead of now. Just thinking about it makes me wonder how much further in life I would be right now. People who pick a job based on money or having a job are never happy. I have friends who only look forward to the weekends.. that is a life I couldn’t live. I look forward to every day! Too many people have jobs that they hate, but they are stuck. They need the pay and can not change. If everyone spent some time thinking about their career before they enter it, they probably would pick one they like and have the skills to succeed.